In war we grow up quickly. In war, time appears to last longer. Moments can last a lifetime. So too can careers be made in a single moment; for war is an opportunity for the quick-witted. Advancements and promotions happen more quickly and unexpectedly in the blaze of battle than in the slow meandering predictability of peacetime. War in a paradoxical way makes things less complicated. There we are offered life in black and white. We prioritize through the necessity of self-preservation and scorn indecision and long term planning. The chaos of change finds unexpected rulers. And in the twilight of war, a prospective ruler has, in order to move from the military to the political, only to paint himself a ‘freedom-fighter’ and let the blackened image of his defeated enemy serve to contrast the radiance of his own brightness. Hitler was that moral foil. He has remained the dark touchstone of European politics for over seventy years now and shall remain that way for much time to come. He is the sunless end of the dark spectrum but it is difficult to find an answer why. Did he kill more than any other leader? Did he cause more suffering? Was he crueller? Madder? Less human than any other? The prosaic answer is probably not. Comrade Stalin and Chairman Mao can be accused of wiping out more of their own populations than Hitler killed enemies (as unpalatable as such blood algebra is to their respective victims). Cruelty has no bar, and even Hitler’s xenophobia and race-baiting have seen analogies in countless smaller and less ‘meaningful’ clashes from Rwanda to Yugoslavia, Darfur to Dili. What makes Hitler special is not his spectacular brutality but the unanimous recognition of him, by the Giants of Yalta, as the most brutal, the greatest evil. In moral terms the Pandora’s Box that was opened during World War II needed to be closed again and the denigration of Hitler absolved many sins which weren’t only his. Hitler became, somewhat bizarrely, a continent’s scapegoat. Anti-Semitism, ultra nationalism, authoritarianism, and mystical and science-fiction politics were prevalent throughout Europe in the twenties and thirties. That fact is often conveniently forgotten by European nations who are brought up convinced that they were victims, those who ultimately defeated Hitler. Hitler equals evil. They are therefore the divinely-ordained custodians of moral rectitude. The moustache and raised arm are instant symbols of tyranny. 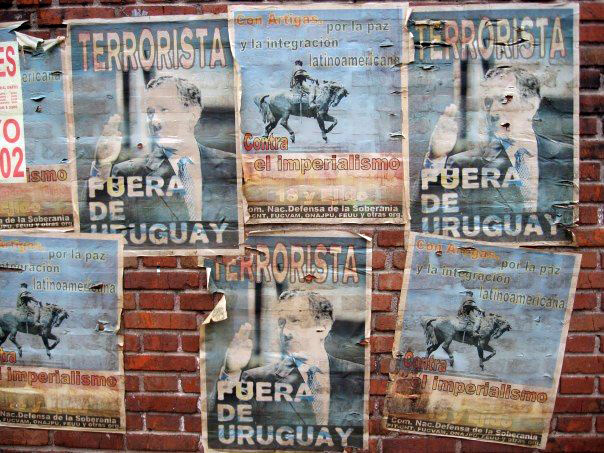 Protesting George W Bush’s visit to Uruguay, Montevideo 2007. This nervous gloss on history may have been a psychological necessity, a way of burying the dark deeds of humanity in the ceremonial cremation of a symbolical incarnation of those deeds. Perhaps it reflected an aspiration to be simply better people, by putting what was ‘too much’ behind them. However, those who leap-fogged to power in the wake of World War II, would rule with remarkable longevity, in East and West, under Soviet tutelage, under American protection, or as independent islands of authoritarianism. And their rule was built upon a cracked plinth of treachery and wishful thinking. 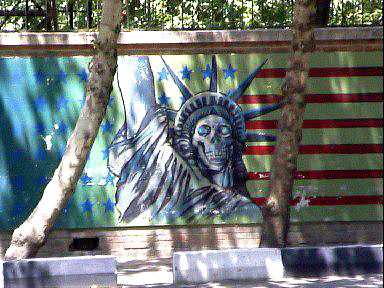 Great Satan, former US Embassy/’US Den of Espionage’, Tehran. 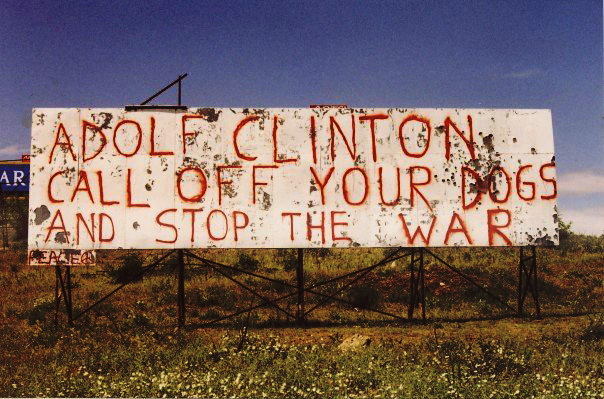 Western politics decry the deliberate indoctrination of free peoples by state-sponsored ideas. Propaganda is a dirty tool left to Goebbels and the Communists. And yet the illusion of an absence of propaganda in a liberal society can be as dangerous as the obvious existence of propaganda in a restrictive society. The West may disingenuously belittle the propaganda of the Iranian revolution or Saddam Hussein’s Iraq, as though it were devoid of its own propagandas. As though the internet precludes dictatorships, and the sins of our rulers have evolved into minor ones. When a Revolutionary Guard, asked his opinion of America’s intentions in the Middle East, decries Great Satan’s meddling, we see this biblical invocation as a schoolboy production of an infantile propaganda. As though we are punishing the country’s rulers for their lack of tact, rather than the repression beneath which their tactlessness fails to hide. And yet the only difference between us is that we, in the West, have moved from the Religion of the Ideal to the Religion of the Real in order to dress our grand designs and ignoble intentions. When we are confronted by an enemy, we don’t call him Satan, we call him Hitler.